In this current affair weekly article reflects a quick-shot of events happened during the week. Study of such current affairs quizzes is very important for IAS Exam. 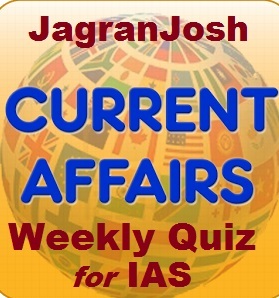 Here, we have compiled the current affairs quizzes created on daily basis from 29th April to 5th May 2017, crucial for the upcoming IAS Prelims Exam 2017. Current affair is one of the important sections of IAS Exam and it needs a consistent study with a great thrust. A better practice of current affairs quiz enhances not only the chances of scoring good marks in IAS Prelims Exam but it also gives an edge to the preparation of IAS Mains Exam. Here, we have compiled the current affairs quizzes created from 29th April to 28th April 2017, crucial for the upcoming IAS Prelims Exam 2017. 1) Under One IP- Two Dispensaries scheme, the Insured Person (IP) is given an option to choose two dispensaries, one for self and another for the family through an employer. 2) It is launched under the Ministry of Health and Family Welfare. Ministry of Labour and Employment launched the scheme One IP- Two Dispensaries on the occasion of International Labour Day recently. Under One IP- Two Dispensaries scheme, the Insured Person (IP) is given an option to choose two dispensaries, one for self and another for the family through an employer. This will benefit all IPs, especially migrant workers who are working in other than home State, while their families are living in their native States. Because of non-availability of the option of the second dispensary, the dependent members of the family are often deprived of medical benefits. By introducing the concept of ‘One IP- Two Dispensaries’, IP, as well as their family members, would now be able to get treatment from either of the dispensaries and in the case of emergency from any ESI Institution. 2. Recently, researchers have successfully generated cartilage tissue using a 3D bio-printer. Which type of stem cells was used in this process? Researchers have successfully generated cartilage tissue using a 3D bio-printer, an advance that could lead to new treatments for osteoarthritis. The advance represents a giant step forward in the ability to generate new, endogenous cartilage tissue. The team used cartilage cells harvested from patients who underwent knee surgery, and these cells were then manipulated in a laboratory, causing them to rejuvenate and revert into “pluripotent” stem cells — cells that have the potential to develop into many different types of cells. Stem cells are undifferentiated biological cells that can differentiate into specialised cells and can divide to produce more stem cells. In mammals, there are two broad types of stem cells: embryonic stem cells, which are isolated from the inner cell mass of blastocysts, and adult stem cells, which are found in various tissues. In adult organisms, stem cells and progenitor cells act as a repair system for the body, replenishing adult tissues. In a developing embryo, stem cells can differentiate into all the specialised cells—ectoderm, endoderm and mesoderm (see induced pluripotent stem cells)—but also maintain the normal turnover of regenerative organs, such as blood, skin, or intestinal tissues. 1) Green bonds are like any other Debt instrument. 2) The issuer of a green bond states that capital is being raised to fund ‘green’ projects. 3) Green bonds are issued by RBI only. A green bond is very similar to any bond which is a debt instrument with which an entity raises money from investors. The only difference is that the issuer of a green bond publicly states that capital is being raised to fund ‘green’ projects, which typically include those relating to renewable energy, emission reductions etc. Green bonds are issued by multilateral agencies such as the World Bank, corporations, government agencies and municipalities. Institutional investors and pension funds also have an appetite for such bonds. I. The Sharda Committee was constituted by the Ministry of Skill Development and Entrepreneurship for Rationalisation and Optimisation of the Functioning of the Sector Skill Councils. II. Sector Skill Councils (SSCs) are mandated to ensure that skill development effort being made by all the stakeholders are in accordance with the actual needs of the industry and develop National Occupational Standards/Competency Standards and Qualification Packs (QPs). The Ministry of Skill Development has invited comments/ suggestions of the public on the Sharada Prasad Committee constituted to Review, Rationalise and Optimise the Functioning of Sector Skill Councils. Sector Skill Councils (SSCs) are industry led and industry governed bodies which have been mandated to ensure that skill development effort being made by all the stakeholders are in accordance with the actual needs of the industry and develop National Occupational Standards/Competency Standards and Qualification Packs (QPs). Presently, the National Skill Development Corporation (NSDC) has approved the formation of 40 SSCs in different Sectors. In order to ensure convergence and optimal functioning of SSCs as per mandate were given under the National Policy for Skill Development and Entrepreneurship 2015, it was decided to constitute a Committee to review the functioning of the SSCs and provide a roadmap for their harmonious growth so as to ensure effective development of the skilling ecosystem. I. The Ministry of Urban Development started the “Swachh Survekshan” survey, the ranking of cities on cleanliness and other aspects of urban sanitation. II. The performance evaluation of the Swachh survekshan is conducted by Quality Council of India (QCI). The largest ever Sample Survey of over 18 lakh citizens has revealed that sanitation in cities and towns of the country has substantially improved during the last one year, confirming that the ‘Swachh Bharat’ buzz is making a difference on ground with people clearly perceiving a change for the better. Results of the ‘Swachh Survekshan-2017’ have confirmed that the efforts being made under Swachh Bharat Mission have made a positive impact on cleanliness situation in urban areas. In order to foster a healthy competition between cities for improving cleanliness standards, the Ministry of Urban Development (MoUD) started the “Swachh Survekshan” survey, ranking of cities on cleanliness and other aspects of urban sanitation, in 2016 which ranked 73 cities in the country. On the same lines, MoUD has initiated “Swachh Survekshan” 2017 which will conduct a survey to rank 500 cities of India. The performance evaluation of the Swachh survekshan is conducted by Quality Council of India (QCI), an autonomous body established by Government of India in 1997 for Quality assurance in all spheres of activities including Governance. I. The objective of SAMPADA is to supplement agriculture, modernise processing and decrease agri-waste. II. Scheme for Agro-Marine Processing and Development of Agro-Processing Clusters (SAMPADA) is an umbrella scheme incorporating ongoing schemes of the Ministry like Mega Food Parks, Integrated Cold Chain and Value Addition Infrastructure, Food Safety and Quality Assurance Infrastructure, etc. III. The implementation of SAMPADA will result in the creation of modern infrastructure with efficient supply chain management from farm gate to a retail outlet. The Cabinet Committee on Economic Affairs, chaired by the Prime Minister Shri Narendra Modi has given its approval for restructuring the schemes of the Ministry of Food Processing Industries (MoFPI) under new Central Sector Scheme – SAMPADA (Scheme for Agro-Marine Processing and Development of Agro-Processing Clusters) for the period 2016-20 coterminous with the 14th Finance Commission cycle. SAMPADA with an allocation of Rs. 6,000 crore is expected to leverage the investment of Rs. 31,400 crore, handling of 334 lakh MT agro-produce valuing Rs. 1,04,125 crore, benefit 20 lakh farmers and generate 5,30,500 direct/ indirect employment in the country by the year 2019-20. The objective of SAMPADA is to supplement agriculture, modernise processing and decrease Agri-waste. SAMPADA is an umbrella scheme incorporating ongoing schemes of the Ministry like Mega Food Parks, Integrated Cold Chain and Value Addition Infrastructure, Food Safety and Quality Assurance Infrastructure etc and also new schemes like Infrastructure for Agro-processing Clusters, Creation of Backwards and Forward Linkages, Creation / Expansion of Food Processing & Preservation Capacities. 7. Recently the Union Cabinet has given its ex-post facto approval for the signing the Memorandum of Cooperation (MoC) on Railway Safety with which of the following countries? Recently, the Union Cabinet has given its ex-post facto approval to the signing the Memorandum of Cooperation (MoC) with Japan on Railway Safety. The MoC has already been signed in February 2017. • Any other relevant railway safety matter jointly determined by both the sides within the scope of this MoC with consideration for major railway accident preventions based on the analysis of accident causes. I. This policy seeks to accomplish the PM's vision of 'Make in India' with the objective of nation building and encourage domestic manufacturing. II. The policy mandates to provide preference to Domestically Manufactured Iron & Steel Products (DM1&SP), in Government Procurement. The Union Cabinet chaired has approved the policy for providing preference to domestically manufactured iron & steel products on Government procurement. This policy seeks to accomplish the PM's vision of 'Make in India' with the objective of nation building and encourage domestic manufacturing. The policy mandates to provide preference to Domestically Manufactured Iron & Steel Products (DMI&SP), in Government Procurement. The policy is applicable on all government tenders where price bid is yet to be opened, DMI&SP policy provides a minimum value addition of 15% in notified steel products which are covered under preferential procurement. In order to provide flexibility, Ministry of Steelmay review specified steel products and the minimum value addition criterion. I. The NSP 2017 will create self-sufficiency in steel production by providing policy support & guidance to private manufacturers, MSME steel producers, CPSEs. II. It will enhance the global steel demand. III. It will facilitate foreign investment. The Union Cabinet chaired has given its approval for National Steel Policy (NSP) 2017. The new Steel Policy enshrines the long term vision of the Government to give impetus to the steel sector. It seeks to enhance domestic steel consumption and ensure high-quality steel production and create a technologically advanced and globally competitive steel industry. • Enhancing the domestic steel demand. 10. South Western Command’s Corps ‘Strike One’ successfully carried out the firing of the advanced BRAHMOS Block III land attack cruise missile system on 3rd May in which of the following Islands of India? South Western Command’s Corps ‘Strike One’ successfully carried out the firing of the advanced BRAHMOS Block III land attack cruise missile system in the Andaman & Nicobar Islands on the 3rd of May 2017 for the second consecutive day. The successive launches reinforce the formidable weapon’s precision strike capability. The long-range tactical weapon was successfully tested from the same location on the 2nd of May, 2017. These successful firings of the supersonic cruise missile were carried out in full operational land-to-land configurations from Mobile Autonomous Launchers (MAL) at its full-range. Meeting all flight parameters in a copybook manner while conducting high level and complex manoeuvres, the multi-role missile successfully hit the land-based target with desired precision, in both the trials demonstrating its accuracy of less than one metre. I. eVIN (Electronic Vaccine Intelligence Network) is an indigenously developed technology system in India that digitizes vaccine stocks and monitors the temperature of the cold chain through a smartphone application. II. The innovative eVIN is presently being implemented called across twelve states in India. III. eVIN aims to support the Government of India’s Universal Immunization Programme by providing real-time information on vaccine stocks and flows, and storage temperatures across all cold chain points in these states. eVIN (Electronic Vaccine Intelligence Network) is an indigenously developed technology system in India that digitizes vaccine stocks and monitors the temperature of the cold chain through a smartphone application. The innovative eVIN is presently being implemented called across twelve states in India. eVIN aims to support the Government of India’s Universal Immunization Programme by providing real-time information on vaccine stocks and flows, and storage temperatures across all cold chain points in these states. The technological innovation is implemented by the United Nations Development Programme (UNDP). eVIN aims to strengthen the evidence base for improved policy-making in vaccine delivery, procurement and planning for new antigens in India. eVIN provides an integrated solution to address widespread inequities in vaccine coverage by supporting state governments in overcoming constraints of infrastructure, monitoring and management information systems and human resources, often resulting in overstocking and stock-outs of vaccines in storage centres. 12. Recently, the Swachh Survekshan -2017 has been released. Which of the following cities of India has been emerged as the ‘Fastest Mover Big City’? Faridabad in Haryana has emerged as the ‘Fastest Mover Big City’ at the national level in the Swachh Survekshan -2017 results of which were announced recently by the Minister of Urban Development M.Venkaiah Naidu. At the national level, Tirupati was ranked the ‘Cleanest Medium City’ while Ambikapur, Chattisgarh bagged this honour in Small Cities category. Rewa, Madhya Pradesh emerged as the ‘Faster Mover’ in medium cities category, Khargone, Madhya Pradesh moved the fastest by significantly improving it’s rank this year over that of 2014 Survey in small cities category. 13. The Insolvency and Bankruptcy Board of India (IBBI) has constituted a Technical Committee in accordance with Regulation 14 of the IBBI (Information Utilities) Regulations, 2017 under the chairmanship of which of the following person? 14. Recently, the Union Cabinet chaired has given its ex-post facto approval to the signing of Memorandum of Understanding on development of a Urea and Ammonia manufacturing plant in which of the following countries? Recently, the Union Cabinet has given its ex-post facto approval to the signing of Memorandum of Understanding with Malaysia on development of a Urea and Ammonia manufacturing plant in Malaysia with off take to India and/or off take of existing surplus Urea from Malaysia to India. The project is expected to cost US$ 2.1 billion with capacity to produce 2.4 million tonnes of Urea and 1.35 million tonnes of Ammonia per annum and dedicated supplying to Indian market. The signing of MoU will ensure consistent supply of Urea and Ammonia to cater the need of the country at a lower price, if agreed to by both the participants. 15. The “South Asia satellite” being built by which of the following countries for use by countries of the South Asian Association for Regional Cooperation (SAARC) region which is to be launched on May 5, 2017? 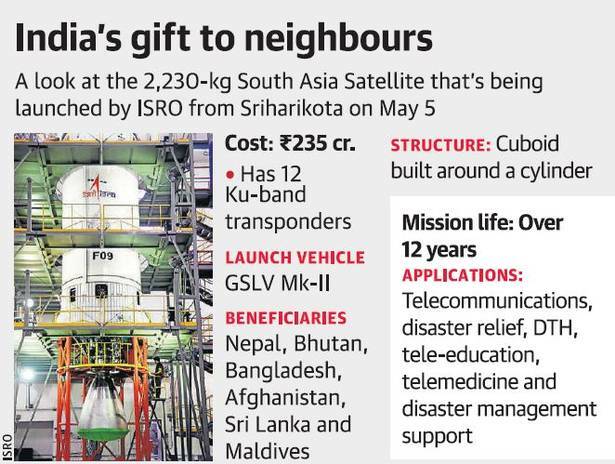 The “South Asia satellite” being built by India for use by countries of the South Asian Association for Regional Cooperation (SAARC) region will be launched on May 5.